World Poetry Celebrates the Jazz Great Leslie Pintchik! 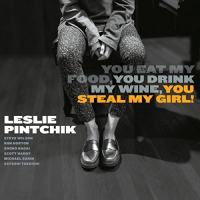 Ariadne’s Notes: World Poetry Cafe Radio Show, CFRO 100.5 FM , welcomed the talented composer and musician Leslie Pintchik calling in at 1:30 pm PST with the new CD: YOU EAT MY FOOD, YOU DRINK MY WINE, YOU STEAL MY GIRL! Leslie kindly gave advice and wisdom to a young adult in England worried about her career. One of my favorite parts of the show was when she was describing having composed a song and was looking for a title, when she heard a loud voice behind her in New York, shouting: “YOU EAT MY FOOD, YOU DRINK MY WINE, YOU STEAL MY GIRL!” She had the name of her song which became the title of the CD. A fascinating interview with the interesting songs and the exciting guest. Do not miss this show, below. Pianist and composer Leslie Pintchik found the title for her new album in one of those “only in New York” moments. While crossing Canal Street at West Broadway in the SoHo section of Manhattan, she heard a voice behind her yell, “You eat my food, you drink my wine, you steal my girl!” As it happened, she’d just completed writing a new composition, and at that very moment she knew she’d found its title. It was a perfect fit for the sharp-elbows vibe of the piece, with its samba-funk groove, understated humor and fender-bender of an ending. So with one gruff shout, serendipity handed her a bold, spunky title, for a bold, spunky tune. With its implied but elusive narrative and personality to spare, the outburst also turned out to be a perfect title for Pintchik’s new recording, which features six of her original tunes and two standards. As on her five previous albums, Pintchik has penned a collection of songs overflowing with warmth, humor, tenderness, depth and smarts – without forsaking her razor-sharp edge. Pintchik is unique in combining a brisk energy and drive with a gift for accessible, infectious melodies – like that overheard accusation, her music strikes a unique balance between the sharp-edged and the charming. You Eat My Food, You Drink My Wine, You Steal My Girl! will be released February 23, 2018 via Pintch Hard Records. In his liner notes for the CD, Allen Morrison writes: “As a composer, [Pintchik is] like a novelist, unspooling each song like a good story with twists and turns, and with a story-teller’s patience and sense of form. And, like a good novel, her songs appeal to both the head and the heart; they are subtle, sometimes wry, sometimes somber. I think they’re not-so-buried treasures, waiting to be discovered by other jazz artists.” In addition, the wide range of grooves (samba-funk with a touch of partido alto, swing, bolero, traditional samba, straight-eighths, and ballads-all played with exceptional skill and pizzazz by Leslie and her top-notch band members) is a great added pleasure. “You Eat My Food, You Drink My Wine, You Steal My Girl!” is not the only mouthful of a title on the album. 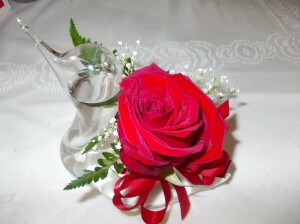 It’s topped by “Your call will be answered by our next available representative, in the order in which it was received. Please stay on the line; your call is important to us,” which should instantly raise the blood pressure of anyone who’s ever wasted hours of their life on hold to fix – or at least attempt to – a problem that’s already wasted too much time. Fueled by that all-too-common experience, the tune swings hard with a fervor born of equal parts frustration and an antic comic spirit. Special kudos to the rhythm section for its drive amidst the unexpected stops and starts. In addition to composing the music for her band, Leslie has also written the liner notes for some notable recent jazz CDs, including Duologue by saxophonist Steve Wilson and drummer Lewis Nash (on the MCG label), and Daybreak by pianist Bruce Barth (on the Savant label). 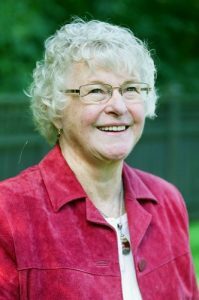 This entry was posted in Ariadne's Notes, E-Poets, Featured Poets, General and tagged Author Sharon Rowe, Bernice Lever, International Peace Award Ariadne Sawyer, Laura Kelsey, Leslie Pintchik, Victor Schwartzman on March 19, 2018 by Ariadne. 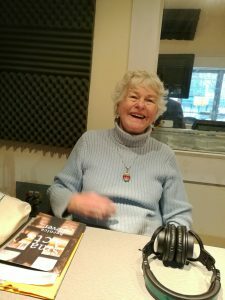 Ariadne’s Notes: On March 15, at 1:10 PM PST, the talented poetess Bernice Lever called into the World Poetry Café radio Show. 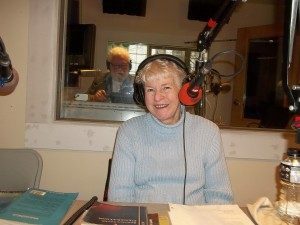 CFRO 100.5 FM to bring the listeners up to date on her poetry, events and wisdom. Also featured was Leslie Pintchik , Jazz great who will be featured next. the show was dedicated to Stephen Hawkins who was a hero to so many including the special abled. 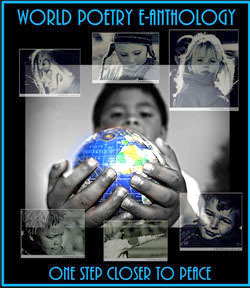 The World Poetry Team of Ariadne Sawyer, MA , Victor Shartzman and special volunteer Sharon Rowe. Music from Laura Kelsey’s upcoming new CD: Dispel and from Leslie Pintchik’s new CD: YOU EAT MY FOOD, YOU DRINK MY WINE, YOU STEAL MY GIRL! TO LISTEN TO SHOW CLICK RIGHT HERE! This entry was posted in Ariadne's Notes, E-Poets, Featured Poets, General and tagged Author Sharon Rowe, Bernice Lever, Braitwaite and Katz, International Peace Award Ariadne Sawyer, Laura Kelsey, Leslie Pintchik, Victor Schwartzman on March 19, 2018 by Ariadne.